Porsche has set sales records by adding SUVs, diesels and the Panamera four-door coupe-styled sedan to a lineup that once only featured sports cars. The automaker is re-inventing itself again for the electric and autonomous age. Although "The Origin of Species" was written more than 150 years ago, Charles Darwin's theory of natural selection never had more meaning for Oliver Blume than today. Porsche's 49-year-old CEO seems to have made biology compulsory reading for his management team as part of his strategy for 2025. The sports-car maker views the future as a matter of survival or extinction following a "Big Bang," Porsche's term for the digital revolution that has already spawned new competitors and business models. Referencing writings on evolution, its IT head Sven Lorenz said: "It's not the strongest species that survive but the ones most able to adapt." Porsche's alarmist language is fitting: investors seem to believe carmakers are facing a doomsday scenario, the proverbial dinosaurs staring up at the oncoming meteor. "There's nothing cheaper in terms of quality blue chips in global equity markets than the OEMs, including the Germans. They are at recession-low valuation levels," analyst Arndt Ellinghorst of Evercore ISI said. Only Toyota, Volkswagen and Daimler are worth more than electric car maker Tesla. While it's now considered a must for industry executives to discuss the inherent and substantial risks stemming from technological disruption, few paint as bleak a picture as Porsche. This is surprising given the carmaker appears more immune than most to megatrends such as shared mobility, electric vehicles and autonomous driving. Not only does its 911 remain the global benchmark for luxury performance coupes, the company's finances are rock solid. Porsche's operating profit last year had never been higher and its 17 percent return on sales was second only to Ferrari's 19 percent in 2016. 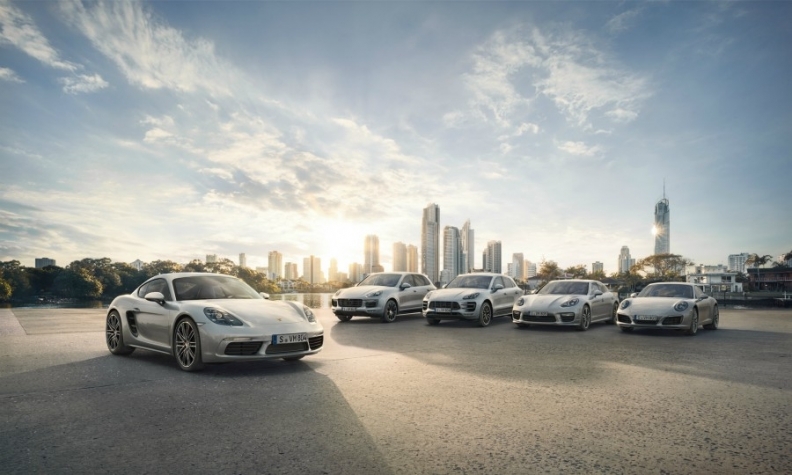 Porsche also surpassed its 200,000-unit-a-year sales target in 2015 -- three years ahead of plan. Last year's total was a record 237,778 vehicles. To reach that level of volume, Porsche has had to add mainstream vehicles that some purists disdain. The brand, however, has proved flexible enough to make additions such as the Macan midsize SUV and its first station wagon, the Panamera Sport Turismo, without sacrificing "emotional sportiness," as Blume calls it. On the other hand, Porsche's success is arguably also its greatest weakness. Thus far, the brand has defined itself as a carmaker that sells gasoline-powered dreams on four wheels. Mashing the pedal and hearing the howl of the company's trademark boxer engine isn't enough, so it's no surprise then that Porsche fans already cried out when the smaller 718 model was downsized from six cylinders to just four. Moreover, one design element common to every Porsche ever built is a central instrument cluster dominated not by a speedometer but an analog rev counter. How does one mimic these traits in a whisper-quiet electric car? "Porsche is done, conceptually" said Tesla owner Hasso Plattner, who is chairman and founder of German software giant SAP. Unable to ignore oncoming megatrends, Blume and his team believe that pulling all the usual levers to improve Porsche's business – making everything a bit lighter, a bit quicker or a bit more affordable – simply won't be enough. Without questioning the fundamentals, a company will end up ceding any mantle as an innovator to its competitors. "To a degree, carmakers will have to become internet companies and turn the tables on companies such as Google that are encroaching into our territory," Porsche Chief Financial Officer and Deputy CEO Lutz Meschke told reporters, arguing only those that adapt by monetizing customer data will still succeed in the future. Citing the power that information wields, Porsche says Facebook can understand an individual better than a colleague with just 20 likes; after 300, though, its algorithms can already describe that person better than their own partner. One company manager intimately acquainted with the tech world is Thilo Koslowski, who was appointed head of Porsche Digital last year. The Silicon Valley veteran, who founded the automotive practice of IT research firm Gartner in 1997, believes digitalization offers the industry a unique chance to put the car back into the center of life -- if they grab it. Otherwise the car risks becoming "a product seen as no longer relevant that belongs on the scrap heap," he told industry executives at a conference in Berlin in April. The ultimate goal is to become a platform provider that generates revenue growth beyond the traditional car, for example, by teaming up with consumer goods manufacturers. Koslowski also sees several possibilities stemming from the carmaker's owner clubs, such as easily sharing videos of driving experiences digitally. Ultimately, he believes either a carmaker offers an aspirational ownership experience or it become just another run-of-the-mill mobility provider competing on cost. "There is no in between," Koslowski said, "since then you will be left behind – and there will be companies that are left behind, a whole bunch." Overlooking the placid waters of the Spree River in Berlin's trendy district of Friedrichshain, Porsche Lab workers move in and out of loosely arranged "scrums." A small team of 14 employees headed by Boris Behring tests the feasibility of technological innovations such as Blockchain for Porsche's business. Coaching is the philosophy here, not management, and the goal is a cross-pollination with the city's thriving startup scene. Two people working at the communal tables were from one of several new mobility companies in Germany's capital. During a tour earlier this year, Meschke said the lab served as an incubator passing on ideas that prove promising to Koslowski's Porsche Digital, which then creates concrete customer applications and business ideas. Speed here is a necessity. Developers are told not to wait to work out all the bugs, but test possible services on the market once they are 80 percent finished. For Porsche engineers trained not to introduce an innovation until it has been fully vetted, this idea verges on blasphemy. In the digital economy, however, apps often have a shelf life of weeks. According to the CFO, the industry has little choice but to look for growth opportunities elsewhere once self-driving cars dramatically increase vehicle utilization rates. "Today it's 5 percent, but [soon] we will be talking over 70 percent to 80 percent efficiency," the CFO said. "That means we will need far fewer cars, so automatically the growth in vehicle sales is limited." To compensate for the loss of volume, he said more than 30 percent of revenue in the future would have to be generated from new businesses. Normally, Porsche only refers to a target of double-digit share of sales, but the CFO was a lot more forthcoming during the day of the tour. When asked why Meschke deviated from the usual talking points, a Porsche official said: "It's a wake-up call. We need new ideas." As a result, Porsche is enlisting the help of trend scouts at venture capital firms such as Israel's Magma and e-Ventures, which specialize in providing seed funds to startups before a bank would risk extending a loan. If successful, there is an option for the carmaker to acquire a strategic holding as part of an exit by its venture capital partners. One recent example was Porsche Digital's investment in a German parking solutions startup that will provide the base upon which Porsche plans to establish an ecosystem of services. The 1 millionth Porsche 911, an Irish green Carrera S (shown), was produced in May. The company says the 911 is still the most strategically important model in its range. Transformations are typically that much harder to execute when a company starts from a leading position, however. Germany, home to both of Porsche's production plants and its main r&d site, struggles in particular, when it comes to taking risks. According to a study published in August 2015 by university professor Andreas Kuckertz, the tolerance for entrepreneurial failure is not only low, it is also heavily stigmatized in the country. Yet Evercore's Ellinghorst says changing an entire organization requires no less: "You need to be pretty radical in the way you approach it to transform premium sportiness -- everything that has defined the DNA of the brand -- into something new." Porsche managers like to say the 911 – and by extension the brand built around it – successfully unifies opposites, such as tradition and future or the everyday practicality of a car that is equally at home on a racetrack. But it is perhaps a third marriage of yin and yang that is most crucial to its future: exclusivity and social acceptance. Without the two, Porsche cannot maintain both high margins and high volumes. "Ferrari and Porsche are very, very different animals," Ellinghorst said. When it first debuted in 1963, the 911's simple, graceful design, with its emphasis on the sloping rear silhouette, did not polarize in an age of muscle cars such as the Chevrolet Corvette or Pontiac GTO that defined themselves through their aggressive front ends and massive engines. "The worst thing that can happen is if you drive up in a car like this [the 911] and someone turns up their nose. That must not happen," said August Achleitner, head of the model range since 2001. He believes the 911's dominance of its segment can be attributed to its understated elegance. "We sell more than 30,000 sports cars a year. No one else in the segment achieves that." To ensure the 911 doesn't polarize in a future increasingly dominated by electric cars, the carmaker is setting out ecological targets for the first time in its 2025 strategy. "A Porsche 911 has always been the more sustainable car in its class. Where others needed 10 cylinders, we limit ourselves to six and are faster on any test track," Blume said. But there are limits even for Porsche's engineers. Development of a six-cylinder plug-in hybrid 911 was put on hold last year. Executives feared customers would not have accepted a compromise in performance due to the added weight, and for the company it would have meant diluting margins on its key model by cannibalizing sales of other, more lucrative 911s. 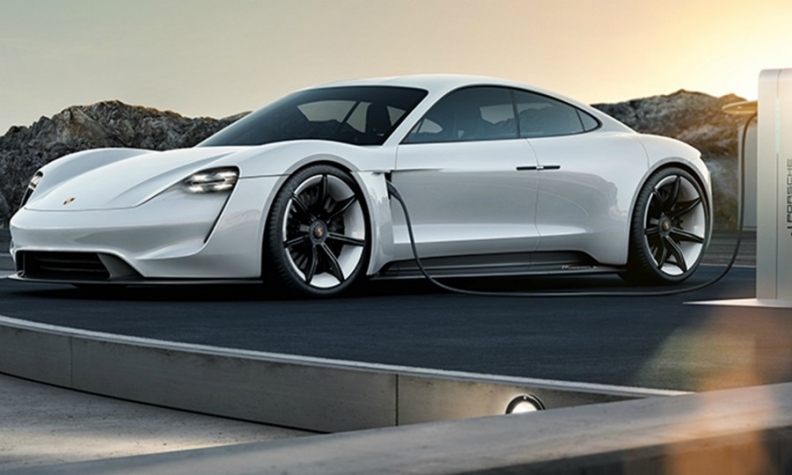 When it debuts in 2019, the Porsche Mission E (shown here as a concept) will be counted on to ensure the company's long-term success. For that reason, a few hundred meters from where it builds its two sports car models, construction is underway on a new factory hall that will hold the key to its future. Starting in 2019 it will be home to the first full-electric Porsche, the Mission E. At 700 million euros, the production site is a bold gamble. Rather than locate production at its plant on the outskirts of Leipzig, where there's plenty of room to grow, Porsche chose to add a second assembly line and new paint shop in its cramped, multi-level factory in the heart of Stuttgart. The Mission E is the most radical embrace of electrification at Porsche, but it wasn't its first. At one point Porsche offered three distinctly different electrified model lines including the purpose-built 918 Spyder plug-in hybrid supercar. That initially upset its fans as more exotic rivals such as Ferrari and Aston Martin eschewed plug-ins. "The uproar when we announced development of the 918 Spyder was massive. Customers asked why we won't simply build a super sports car with more horsepower and a 10-cylinder engine,” recalled one Porsche manager. It was only after achieving the lap-time record for road cars on the Nuerburgring's Nordschleife that orders began to pour in. "Had our engineers in Weissach not developed that, they wouldn't have had the experience to then build the 919 Hybrid Le Mans [racecar], which in turn was crucially important for the Mission E."
Without the Le Mans car's 800-volt electrical architecture, which dramatically reduces the amount of current needed, the cables and wiring would have been too thick and heavy to fit in the Mission E. When the car arrives in two years, Porsche can borrow from its experience with game-changing models. "The launch of the Cayenne, a big-size SUV that was the antithesis of any sporty car, was without any doubt the big break with the past in Porsche history," Felipe Munoz, a global analyst for JATO Dynamics, said. It required the carmaker to overhaul the entire dealer body since its customer group transformed. Suddenly, SUV drivers used to being catered to by brands such as Mercedes-Benz and BMW were showing up in Porsche showrooms. Perhaps Porsche is so obsessed about preparing for the transformation of the industry because it has looked straight into the abyss on more than one occasion. First, a young Ferdinand Piech, nephew of founder Ferry Porsche, virtually bankrupted his family's company pursuing a dream of building a car fast enough to win Le Mans. A generation later, Porsche was nearly taken over by Toyota after a soaring deutschmark and an overdependence on the U.S. market plunged the company into another do-or-die situation. It wasn't so lucky the third time around when a risky attempt to acquire Volkswagen Group backfired in 2009 and cost Porsche its prized independence. The chastened family, led by Chairman Wolfgang Porsche, was forced to sell the carmaker to its prey. Eat or be eaten. Darwin would have approved. But the father of evolution isn’t the only one to predict who will survive. Ferry Porsche himself famously had his own prophesy: "The last automobile that will be built, will be a sports car."